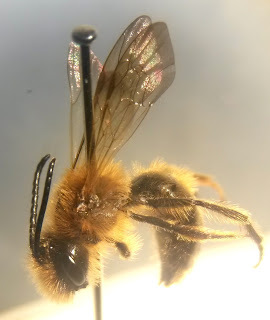 Been a couple of days for clearing the decks so last night I pinned and labelled some stuff that didn't add any new species and the only thing I really spent a lot of time on was this mining bee, which appears to be Andrena helvola. It's a species which has been recorded in fife - the 3rd Scottish record at the time - and not that far from me. Close enough that the area of my square is indicated positively in the distribution. Anyway, I couldn't make it be anything else and we don't have that many Andrenas up here. If someone later tells me I'm wrong I won't be 100% surprised but it looks good at the moment.